On the dry mud around temporary ponds it is possible to find some plant species which is adapted to the short and very variable growth season. The plants germinate during the summer and are fruiting late in the year. The seeds can ly in the mud for several years before they germinate under favourable conditions. Common species are Ranunculus sceleratus, Bidens tripartita and B. cernua. A number of species were in earlier times more common around the village ponds. But due to changes in the use of the ponds they have today become very rare or extinct in Denmark. At the village pond in Voldsted it is in favourable years possible to find the small Limosella aquatica (the picture). It is very rare in Denmark but in very dry summers it suddenly emerges in several places throughout the country. 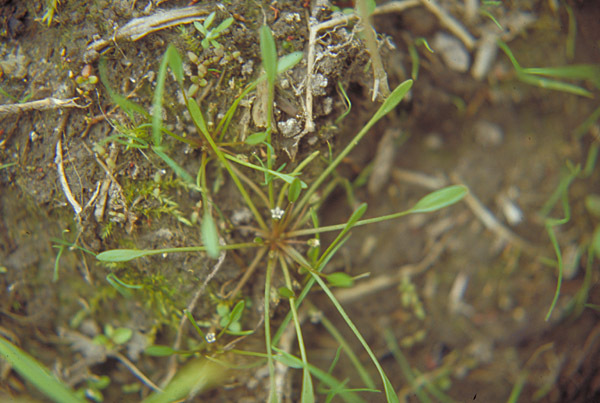 Cyperus fuscus can also still be found a few places while Bidens radiata has disappeared. At the village ponds some species introduced by man could be seen in earlier times. Pulicaria vulgaris and Carex bohemica are now considered extinct while Cotula coronopifolia still can be found. This species has been introduced from South Africa to Europe and has since been spread through birds to a site at the westcoast of Jutland. Back to Lakes in Himmerland.